In the wake of the Eastleigh by-election defeat the Tories "human rights are the root of all evil" brigade are on the march again. Home Secretary, Theresa May and Justice Secretary, Chris Grayling have been variously reported as threatening to withdraw from the European Convention on Human Rights and abolish the UK Human Rights Act. 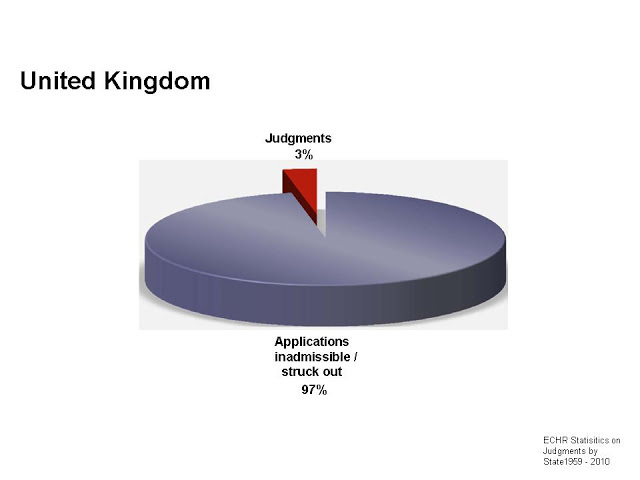 Only 3% of the cases that the UK faces in the European Court of Human Rights (ECrtHR) ever get to a judgment. If you drill into the figures, between 1959 and 2010 the UK lost about 2% of the all cases brought against it to the ECrtHR. They had an even better record in 2011 and 2012 losing just 0.8% (8 out of 955) and 0.5% (10 out of 2082) of the cases brought respectively. Update: Lord Neuberger, President of the UK Supreme Court, reportedly agrees, though in a decidedly understated fashion. The learned judge is also less than enamoured with the government's secret courts and cutting of legal aid, in addition to being concerned about a possible subconcious bias contributing to the gender imbalance in the judiciary. The Guardian's editorial one day on is interpreting Lord Neuberberger's intervention on human rights as a shot across the bows of the little englander Tories branch of government.